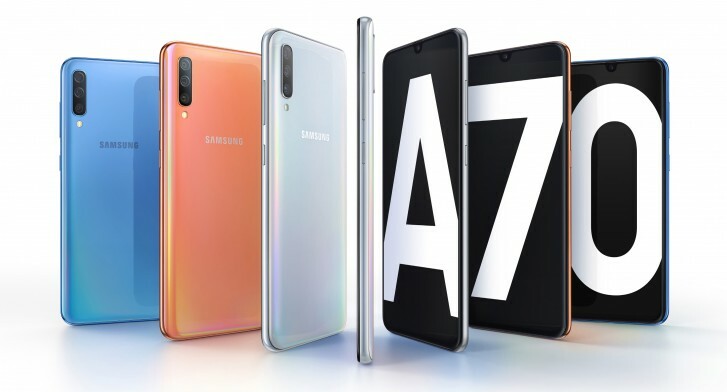 The A-series got its first cinematic screen – the Samsung Galaxy A70 has a large 6.7” Super AMOLED panel with the extra tall 20:9 aspect ratio. It’s an Infinity-U display, meaning a rounded notch for the 32MP selfie camera. The rear camera also has a 32MP sensor (behind an f/1.7 lens), these two are the highest resolution cameras on a Samsung phone yet. The rear camera also features an 8MP ultra-wide angle module (123°) and a 5MP depth sensor. The phone offers an in-display fingerprint reader as well as face recognition as security mechanisms. The Galaxy A70 has a 4,500mAh battery and, interestingly, it will support 25W fast charging. That’s the first Galaxy to go above 18W, aside from the Galaxy S10 5G (which isn’t available yet). There’s no wireless charging, though. The phone comes with 6GB or 8GB of RAM and 128GB of built-in storage. The card slot can house two SIMs and one microSD (up to 512GB), giving you a lot of flexibility. By the way, the 6.7” screen may sound scary, but the phone measures 76.7mm wide – that’s comparable with the Galaxy A7 (2018) and the Galaxy Note9. One Handed Navigation is also available when you only have one hand free. The Samsung Galaxy A70 will launch with Android 9 Pie and One UI, including features like Night Mode and Samsung mainstays like Pay, Knox and Pass (which can use the FP reader to sign you into apps and sites). The Galaxy A70 is shares the “3D Glasstic” build with other A-series phones. A prism effect will give visual flair to the four color options: Coral, Blue, Black and White. Pricing and availability are yet to be detailed, but the company says it will reveal more come April 10.